I've read all of Julie Klassen's books, and I've never been disappointed. If, like me, you've enjoyed the other books written by this author, you'll love The Tutor's Daughter. If you've never read a Klassen book, then this is a good one with which to begin your adventures. You don't have to read them in any particular order. Ms. Klassen has an uncanny knack for drawing her readers right into the story. You will smell the rain, hear the waves crashing against the rocks, and experience the roller-coaster emotions of the tutor's daughter as she not only learns the secret of Ebbingford Manor, but also falls in love with an unlikely suitor. The characters are just what I look for in this genre: interesting, believable for the historical period, and likable. The plot builds to a exciting climax and the book ends with a conclusion that is not only satisfying, but inspirational. What else can I say except it's absolutely delightful! 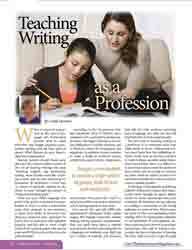 My article, "Teaching Writing as a Profession," has just been published by the Old Schoolhouse Magazine. I wrote this article to help parents discover ways to mentor and inspire a budding author in the family. You can read the entire magazine using this link. or you can read it using the Old Schoolhouse App. I hope you enjoy it!